A cat activity centre is place your cat can go to relax, sleep, play and let out those urges they naturally have, for example scratching and and jumping. It was when me and my partner rescued two kittens and brought them home to live with our other cat we realised that a small scratching post was not going to be sufficient enough to keep our three cats occupied. Yes, at the time our eldest cat went outdoors but the two kittens were too little to go outside and were running riot in our house. So I tried to find something I thought could keep them occupied......and away from our poor furniture. 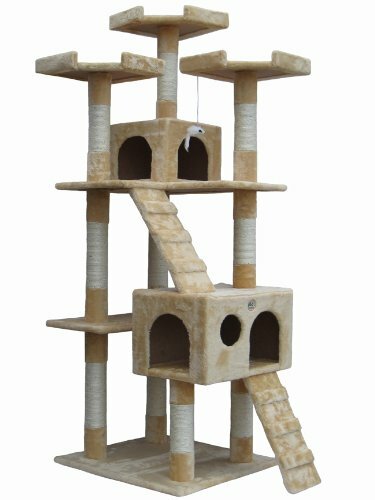 I searched for large cat scratching posts and came across these activity centres and as I am, unfortunately, an impulse buyer just had to get one and see what they were all about. This is the first one I got my hands on. It had multiple levels for my kittens to chase each other on and sleeping areas which they used all the time instead of their beds. It had multiple poles for them to scratch which saved my sofa and carpets from getting ruined......even more then they already had been before the cat activity centre came into our lives. My boy kitten Fudge used to love laying on the top of the highest sleeping tube looking out at the garden. My eldest cat Chewy would try and chase them out of the sleeping places so he could go in their too. It was perfect but we moved house and we sadly lost our oldest cat and then we adopted another cat and three fully grown cats was starting to make our activity centre a bit wobbly as they all loved it so much. So me being the impulse buyer I said I was got an even bigger one. Of course as the rabbits have taken over the conservatory we are going to put our new one in our dining room......which is not used as a dining room. This means we need to downsize a bit so this one is smaller in width though just as tall. I love the fact it has three outside sleeping places at the top. This is perfect for my three and it still has the two inside sleeping places as well as the many scratching posts for them to dig their claws into and ledges to pounce and play on. Wow, how fun are those?! We have 3 cats ourselves and recently got them what I'd call a kitty condo, not quite an activity center, but they do love it also. Great article!